What was the best fan letter you ever received? I love the ones that say “I didn’t get any sleep last night. I ccouldn’t put your book down!” The best letter was probably the one I got from the Houston Oilers football coach, Bum Philips. I guess real men do read Romance! What was your biggest learning experience or surprise during your publishing journey? How hard it is to make it to the top. I had imagined that in no more than 15 books, a person could have a successful writing career. Here I am, 70 books later, still working on it! What would you have done differently as an author if you could do it again? Best piece(s) of writing advice for new writers? Stay with it. Persistence is the key. And write from the heart, books you want to write. Don’t try to write for the market. I’m a total hermit. I rarely go out and when I’m in a group of people, I am completely out of my element. I am basically shy. Writing is the perfect job for me. I’ve started reading Brad Thor. I always look for Susan Elizabeth Phillips–anything new by her. I like Laura Griffin and Dana Marton. What writing book or reference book that you swear by? I used to use the AAA travel books for setting information. Now I do most of my research on the Internet. Google Maps is my go-to resource. Could be anything. Something I see on the news, or an article I read in a magazine. Could be a TV show. Whatever it is, it’s back in my brain somewhere. I can rarely tell you where my stories come from. 2017 is going to be an exciting year for me. 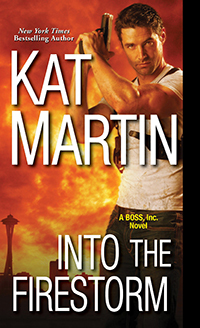 INTO THE FIRESTORM, my new release, is one of my all time favorite books. So I’m excited to see what readers will think. Then in June, BEYOND REASON, the first book in my Texas Trilogy comes out. Lincoln Cain is a multi-millionaire businessman. After 2 years in prison, he pulled himself out of the gutter and changed his life. He’s as tough as they come, which means Carly Drake, the woman who challenges him, is going to be in for a rough ride. Luckily, she’s strong enough to handle him. Which is good because when she finds herself in the sites of a drug lord, she discovers she needs Linc’s help. I’m hoping readers will enjoy both books and I look forward to writing a lot more stories.